Printer Security: Are Your Printer Paper Trays Secure? This blog is to educate on printer paper security and present solutions to prevent unauthorized access to sensitive forms or paper in printer trays. Are Your Printer Paper Trays Secure? Healthcare - as more states and countries enact regulations concerning security and confidentiality, healthcare providers are being required to lock up tamper-resistant prescription paper, HIPPA forms, and any other documents/forms that may be of interest to unauthorized persons. Higher Education - many colleges and universities have printers located around the campus in libraries, study halls, dorms, and other public-accessible locations. This fact makes these printers prime targets for paper theft - students may think "Why should I go buy paper for my printer when I can take paper from the unattended printer sitting in the library?" Might not seem to be much of a problem, but if you have hundreds or thousands of devices in your network and you lose 20, 50, or 100 sheets of paper a day, the losses quickly add up to a substantial amount! Financial - do you keep blank check stock in your printer? No explanation needed here! Locks are designed to prevent crimes of opportunity. A determined thief with uninterrupted access to your printer can break into any printer given sufficient time. He can even walk off with your printer if it is a smaller model! Printer locks are designed to prevent someone from walking up to your printer, opening a tray, and removing a few sheets for their personal or illegal use. Takes only seconds, but can create big problems for the printer/network manager! Unauthorized persons might be patients in a healthcare facility, cleaning staff at any business, employees who are not authorized to use restricted forms, students, or anyone else who comes into contact with the device. Do you have experiences with any of these situations? We'd like to hear from you! What types of forms are you storing in your printer? While many people are rightfully concerned about where the funds will be obtained to pay for the new services, it should create opportunities for many providers to the healthcare industry. With the US Government now more involved at all levels of healthcare, expect to see more regulations concerning security of forms and tamper-proof paper. The National Health Service (NHS) in the UK has published guidelines for handling of security for prescription forms. Guidelines are available for download at the following website: http://www.dhsspsni.gov.uk/pas-security-prescription-forms-guidance-feb08.pdf This document offers a range of measures to help prevent theft of prescription forms and recommended action when a theft does occur. Expect we will see similar requirements in the US in the future. Just announced - new Paper Tray Lock-Mini now available to secure your MFP paper trays! 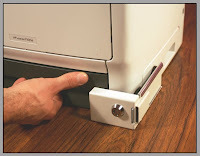 There are times when a standard paper tray lock cannot be installed on a copier or MFP because of interference with a Finisher accessory and/or access panels that open to clear jams. We now offer a solution for these type machines - The PTL-Mini. The PTL-Mini can be installed in tight locations to lock your paper trays. The tubular key locks can be keyed the same as the standard PTL locks, keeping your key management simple. Multiple PTL-Mini locks may be installed on a machine and keyed alike to secure all of your paper trays. Call Lucas Distribution toll free at 866-232-4233 or 770-554-3560 for information, send us an email at sales@papertraylock.com, or visit our website at http://www.papertraylock.com/ Retail priced at $25.35 and quantity discounts are available. Visit our newly designed website at http://www.papertraylock.com/. We have more information in an easier to view format! As a leading supplier of printer paper tray locks to the healthcare industry, we are pleased to announce that Lucas Distribution, LLC is now offering SecureGuard Tamper-Resistant Prescription Forms. Considered by many to be the best-designed tamper-resistant prescription forms available today, SecureGuard prescription forms offer the highest level of protection for your prescription requirements. Visit our website at www.papertraylock.com/Tamper-Resistant-Prescription-Paper.html for more information. Lucas Distribution, LLC Now Offering Convenient Online Ordering! We are pleased to announce that effective November 9, 2010, we will offer an online shopping cart to allow our customers to easily purchase paper tray locks from our website. Don't want to phone or email your order? Now you can place online orders with just a few clicks of your mouse and use your credit card to make a secure payment! Visit our website at http://www.papertraylock.com/ or go directly to our catalog at http://shop.papertraylock.com/ to place online orders for printer paper tray locks. We will be adding new items so keep checking back! In addition to our Printer Paper Tray Locks, you may now order printer cabinet stands and SecureGuard Tamper-Resistant Prescription Paper using our convenient online catalog at http://shop.papertraylock.com/. We offer 25" tall printer cabinets in 2 styles for your printer/fax/mfp machines. Steel construction and locking casters are only 2 of the features offered with these cabinet stands. We are now also offering online ordering of our complete line of tamper-resistant RX papers. If you are not certain which prescription paper you need please call us at 866-232-4233 or drop us an email at sales@papertraylock.com and we will be glad to assist you! We are pleased to announce that Lucas Distribution, LLC is now offering a complete line of security solutions for Laptop and Notebook computers. Unlike most providers, we offer our customers the option to build their own locking solution by choosing from various components offered on our website at http://www.shop.papertraylock.com/. You may also purchase preconfigured kits. We have provided a chart to help you choose the components you need for your particular situation. If you need help determining how to build your solution just drop us a note at sales@papertraylock.com or call us toll-free at 866-232-4233 - we are here to help! We are also preparing to launch a series of lockable, mounting solutions for your flat panel televisions as well as LCD Projectors. Check back for more information in the next couple of weeks. I was at a customer's office recently discussing how to lock the printer paper trays on several of his machines. While we were talking I noticed a storage cabinet that was open - the locks in the handle were broken and he could not lock the cabinet. First thing I did was slap a PTL paper tray lock on the cabinet and his problem was solved! Order PTL-5 Paper Tray Locks - not just for paper trays! We have recently heard from state employees from several states around the US about new security requirements for paper stock used to print passports and birth certificates. Apparently, there have been instances around the country where easy access to birth certificate stock and passport paper stock has allowed unscrupulous employees to engage in illegal activities including selling fraudulent birth certificates and passports. Many states are now requiring that blank paper stock used to print these legal documents be stored in separate, locked locations. An easy-to-implement solution to meet this requirement is to lock the paper stock in your printers using printer paper tray locks. Lucas Distribution can provide locking solutions for any printer or copier. Look up your printer model at our website www.papertraylock.com/Paper-Tray-Lock-Printer-Compatibility-Chart.html or contact us at sales@papertraylock.com to find the best locking solution for your printer paper trays! We are pleased to announce new, lower pricing for SecureGuard Tamper-Resistant Prescription paper. Effective immediately, RX503 Full Sheet Prescription Paper is priced at $39/1 ream; $58.40/2 reams; $119/5 reams. All other types of RX503 perforated prescription paper are priced at $41.20/1 ream; $62.40/2 reams; $128/5 reams. Paper approved for State of Florida is priced at $120/1,000 sheets of any type. Effective July 1, 2011, the State of Florida will require preprinted batch numbers on all tamper-resistant prescription paper used for controlled substances. Standard prescription paper may still be used for non-controlled substance prescriptions. We are pleased to announce a new refrigerator lock for mini refrigerators with doors measuring 1.75" or less in thickness. The new lock is easier to use in that both pieces mount to the refrigerator. To open the refrigerator you merely turn the key to unlock and open the door - no lock pieces to remove or replace when securing the refrigerator! In an effort to close down so called "pill mills" the Florida Department of Health is actively inspecting pain clinics throughout Florida. Among the items inspectors are checking are that clinics are using tamper-resistant prescription paper and that ths paper is kept in a secure location. Secure locations may include a locked cabinet or, more conveniently, a locked printer paper tray. Locking your printer paper trays makes sense - you don't have to remember to remove your prescription paper from the printer every evening and lock it in a cabinet. Simply install a printer paper tray lock on your equipment, load your tamper-resistant prescription paper, and lock the paper tray. Lucas Distribution is offering a complimentary $15 Starbucks Card with all online orders totaling $198 or more (excluding shipping & handling) placed at http://shop.papertraylock.com/ from now through August 31, 2011. This offer includes all products sold on the website, including paper tray locks, dongle lockboxes, prescription paper, laptop locks, and printer cabinets. To receive your Starbucks Card simply place an online order and we will include your card in with your shipment. Limit of one card per customer per online order. Offer expires at midnight on August 31, 2011. Paper Tray Lock Demand is Growing! Lately the demand for our paper tray locks has been growing by leaps and bounds! The word appears to be getting out to locations outside the USA and orders are coming in from the Far East, Middle East, Canada and Europe. Lucas Distribution ships worldwide - if you need to secure your printers or copiers just drop us a note and we will be glad to send a written estimate including shipping to anywhere in the world. On July 1, 2011, O.C.G.A 26-4-80.1 was signed into law requiring that certain Schedule II prescriptions be written on Georgia Board of Pharmacy approved security paper. The law is scheduled to become effective on October 1, 2011. All paper must be approved by the Board and a new Seal of Approval from the Georgia Board of Pharmacy must be affixed on every sheet of security paper used in Georgia. 3. One or more industry-recognized features designed to prevent the use of counterfeit prescription forms. If a vendor meets the above criteria and submits samples of the paper to the Georgia Board of Pharmacy along with written notification, they may market and sell paper in Georgia unlss the Board determines that the paper does not meet the requirements listed above. When a practitioner prints prescriptions there must now be a sequential number printed on each prescription. Practitioners will need to confirm with their software providers how to add the sequential numbering to their prescriptions unless their paper is preprinted with sequential numbers. In the event paper containing the Board seal, sequential numbering, and lot number is not available for a prescription and a medical emergency exists, the new revision also allows for prescriptions on paper meeting the other requirements for approval, for an amount of medicine to cover not more than 30 days. The prescription must contain a statement that a medical emergency exists. This exception only applies to prescriptions written before December 31, 2011. The law also requires practitioners to "employ reasonable safeguards to assure against theft or unauthorized use of security paper.." This infers that prescription paper should be secured while in the printer or removed and locked in a cabinet. Visit www.papertraylock.com/TamperResistant-Prescription-Paper.html for more information. Deadline Approaching for Georgia Board of Pharmacy Approved Prescription Paper! The end of the year is approaching and with it the deadline for using non-approved prescription paper in Georgia. The new law requiring the use of Georgia Board of Pharmacy approved prescription paper for schedule II narcotics went into effect on October 1, 2011. There is a grace period until December 31, 2011, that allows physicians to write prescriptions on non-approved paper if an emergency exists. Starting January 1, 2012, approved paper/pads must be used for all schedule II prescriptions. Healthcare providers should plan now to order custom printed prescription pads and order laser prescription paper that meets the guidelines of the Georgia Board of Pharmacy. It normally takes a week to custom print prescription pads and with the holidays fast approaching there isn't much time left to order pads for delivery this year! On December 14, the Georgia Board of Pharmacy amended the policy that requires all Schedule II prescriptions be written on approved paper containing the Georgia Board of Pharmacy seal and sequential numbering. Previously, Schedule II prescriptions could be written on non-approved paper until December 31, 2011, if they were for an emergency. The prescription has to contain a statement that an emergency exists and the prescription cannot be for more than 30 days of medication. The latest amendment extends the grace period for emergency prescriptions from December 31, 2011 until March 31, 2012. Prescriptions must still be marked for emergency use and cannot exceed 30 days of medication. Healthcare providers should order approved paper sooner rather than later to avoid the hassle of dealing with non-approved paper for Schedule II prescriptions. We have added an order form to our website to provide an easy method of sending us your practice information for custom printed prescription pads. Just complete the form, select 1 part or 2 part pads and quantity of pads desired (in multiples of 4) and click the submit button. We will prepare a proof of your pad and contact you for approval. Once you approve the design we will process the order for printing. Nothing could be simpler! We are happy to announce a new style refrigerator lock that will work on most refrigerators with doors up to 4" thick. The previous model refrigerator locks only worked on refrigerators with doors up to 1.75” thick – essentially limiting their use on mini-type refrigerators. The new PTL lock works on refrigerators with doors up to 4” thick. The PTL Refrigerator Lock is popular because you do not have to remove padlocks, locking plates or other pieces to open the refrigerator. Simply turn the key and open the door, then shut the door and turn the key to lock. Multiple locks may be ordered keyed alike or differently at no extra cost, making key management simple. To order locks or obtain additional information go to http://shop.papertraylock.com/Refrigerator-lock-ptl-fridge-lock.htm or contact Lucas Distribution at 866-232-4233. I am happy to say that we have had an overwhelmingly positive response to our new style refrigerator locks! The only comments to improve the locks were to offer them in black or white colors to match most refrigerator colors. We listened to our customers and so we will now offer refrigerator locks in beige, black, and white color options. The new black or white locks will be ready to ship around February 20. The black lock will look good on black or stainless refrigerators. For more information go to www.papertraylock.com/Refrigerator-lock.html. We finally decided our secure prescription paper web page was not sufficiently user friendly. We did not provide clear instructions as to which paper types were accepted in each state. I am happy to announce that we have updated our website and now finding paper for your state is simple! Go to www.papertraylock.com/Secure-Prescription-Paper-USA.html and click on your state. You will be automatically sent to a web page that shows each style of secure prescription paper that is approved for your state. Once you decide which paper you need simply click on the "ORDER NOW" button to go to our secure shopping cart where you may place your order. The entire process is simple and fast. On March 14, 2012, the Georgia Board of Pharmacy once again extended the deadline to require the use of approved security prescription paper for Schedule II prescriptions. The previous deadline was March 31, 2012 and this is now extended to June 30, 2012. In the interim period before June 30, 2012, emergency prescriptions for Schedule II drugs may be written on non-approved paper for no more than a 30 day supply and the prescription must be marked for "Emergency" use. Our new refrigerator locks are selling beyond our expectations! We are currently backordered on black locks until April 13. We have learned of new applications for these and our other security locks for the marine industry. Lately we have been receiving requests for locks from marina and boat owners who want to secure items on their boats and do not want to drill holes to mount a lock. Our locks are mounted using a powerful adhesive and special feet that form an extremely strong bond to most smooth surfaces. If you wish to drill holes you may also attach the locks with screws. Want to lock your refrigerator or storage locker while you are away from your boat? Use locks from Lucas Distribution to keep your property secure! For more information go to http://www.papertraylock.com/. Printer Paper Tray Locks - How Secure are They? ften we receive calls from prospective customers who ask us "How strong are your printer paper tray locks?" Aside from the fact that we have sold thousands of locks to satisfied users, we can only explain that the locks are very strong when properly installed. As you will see, the lock resists pry bars, crow bars, and a hammer. Granted, given enough time and privacy, any lock can be defeated, but paper tray locks from Lucas Distribution will deter all but the most determined thieves. People who are coping with family members with Prader-Willi Syndrome, Autism, and Alzheimer's often struggle to keep their family members from eating to excess, one of the traits exhibited by persons with these disorders. It can be a challenge to prevent family members from going into the refrigerator while keeping it easily accessible to others in the family. Most refrigerator locks in the market use a padlock and cable system to secure the refrigerator - requires 2 hands to unlock and lock the door. In fact, we also offer this type of locking system. The PTL Refrigerator Lock easily installs with high-strength adhesive, so you do not have to drill holes in your refrigerator. To use the lock simply insert and turn a key 90 degrees and the door is free to open. Close the door and turn the key and the door is locked - simple to perform this task with 1 hand. We can provide multiple keys and we can key multiple locks alike if you have more than 1 refrigerator in your household. Once again the deadline for mandatory use of Georgia Board of Pharmacy approved prescription paper has been extended from July 1, 2012 to September 30, 2012. In the interim period before September 30, emergency prescriptions for Schedule II drugs may be written on non-approved paper for no more than a 30 day supply and the prescription must be marked for "Emergency" use. The deadline for mandatory use of Georgia Board of Pharmacy approved prescription paper has once again been extended from September 30, 2012 to December 31, 2012. In the interim period before December 31, emergency prescriptions for Schedule II drugs may be written on non-approved paper for no more than a 30 day supply and the prescription must be marked for "Emergency" use. We are excited to announce a new product designed to simplify key management for multiple paper tray lock installations. The PTL-5 lock will be available with a combination lock in place of a tubular key lock. The combination lock has 4 digits that can easily be reset to a custom combination by the end user. Now, when securing multiple printers, you can assign each lock a unique key code that will only allow personnel with the correct code to access the paper tray. This eliminates the need to carry a key ring with different key codes to allow access to locks installed on different printers. The PTL-5 Combo lock will be available for shipment the week of November 26. Suggested list price is $49.50 and quantity discounts are available. The Georgia Board of Pharmacy has again extended the deadline to mandate use of approved prescription paper to March 31, 2013. Until March 31, 2013, prescriptions for Schedule II drugs may be written on non-approved security paper for a period not to exceed 30 days and the prescription must be marked for "Emergency" use. The new PTL-5 Printer Paper Tray Combination Lock is in stock and shipping to customers. Effective immediately, we are now offering our popular PTL Refrigerator Locks with a combination lock in place of a key lock. This new lock should prove popular with users who don't want to look for a key to open the refrigerator. The new locks are available in black or white. The combination can easily be reset by the user to one of 10,000 combinations. Locks are priced at $55.50 and quantity discounts are available. Visit our website at http://shop.papertraylock.com/Refrigerator-Combination-Lock-FRIGCOMBI.htm for more information or to place an order. The Georgia Board of Pharmacy has again extended the deadline to mandate use of approved prescription paper to June 30, 2013. Until June 30, 2013, prescriptions for Schedule II drugs may be written on non-approved security paper for a period not to exceed 30 days and the prescription must be marked for "Emergency" use. We are pleased to announce that Lexmar Direct, Ltd., based in Essex, England, is now an authorized reseller for Paper Tray Locks, Refrigerator Locks, USB Dongle Lockboxes and other security solutions from Lucas Distribution. This relationship will benefit our European customers by providing faster delivery and lower shipping costs as compared to ordering locks from Atlanta, GA.
Consumers in Europe and the surrounding areas can contact Lexmar Direct by email at sales@lexmardirect.com. An online shopping cart at www.lexmardirect.com makes ordering a simple task. The state of Georgia has repealed the law requiring all Schedule II prescriptions to be written on paper containing security features that included the GA Board of Pharmacy seal as well as having a serial number imprinted on each page. Lucas Distribution will still offer the paper containing the seal and serial numbers, but the standard security paper will also be available at a lower cost. Lucas Distribution is pleased to announce that our Refrigerator Locks and USB Dongle Lockboxes are now listed on www.amazon.com for purchase. Customers may order our products with the knowledge that their purchases are covered by the amazon.com guarantee! Even though we have thousands of satisfied customers that buy directly from us, we understand that many potential customers only want to purchase through a large entity such as Amazon.com. Regardless of where you purchase your Lucas Distribution security products, rest assured you will receive excellent quality and service along with a lifetime product warranty! Most TV wall mount systems being sold today do nothing to prevent unauthorized persons from unbolting them from the wall and walking off. At Lucas Distribution, we are pleased to announce that we can now offer a TV wall mount system that will keep your flat panel TV or monitor securely attached and protected from theft. Our TV wall mounts are equipped with built-in key locks that secure steel plates covering the mounting hardware at the wall and the rear of the TV set. If thieves cannot access the bolts they cannot remove the TV from the wall. Mounts are available in 4 models, including Flush Mount, Tilt-Only Mount, Single Articulating Arm and Double Articulating Arm. Tilt-only and Articulating models allow the monitor to be tilted up to 20 degrees of up or down. The Tilt-only model allows 13 degrees of swivel right and left while the Articulating models allow the monitor to be swiveled up to 90 degrees. Mounts are easy to install and come with all required mounting hardware. TV wall mounts are compatible with TVs that are equipped with VESA mounting studs - your owner's manual will specify the VESA hole pattern for your TV. All security flat panel mounting systems come with hardware required for installation. Installation will require the following common household tools: Electric drill with 1/4" bit, Philips screwdriver, Socket wrench with 7/16" & 9/16" sockets, and a level. Free shipping is included for any mount delivered anywhere in the continental United States. Shipping outside the continental US will be added to orders.